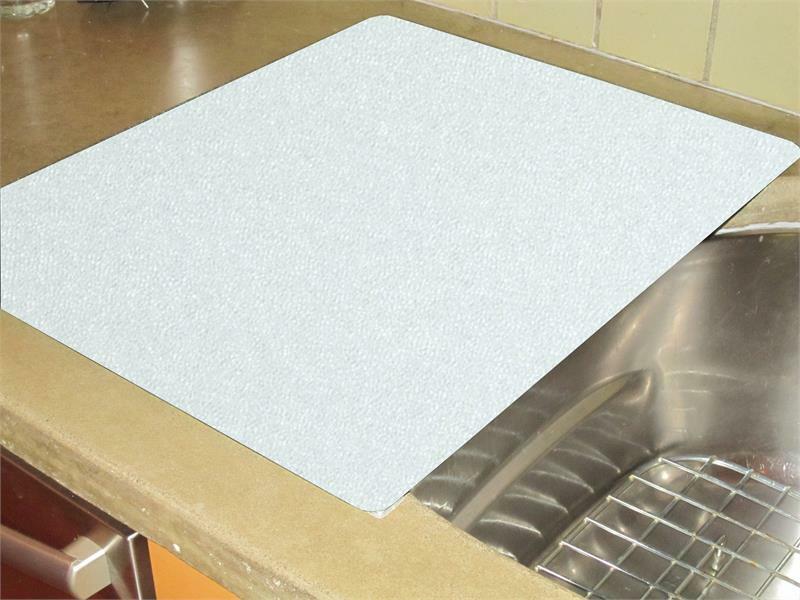 Home > Cutting Boards and Trivets > Glass > Extra Large Surface Saver® for Over Sink Food Prep, 16" x 20"
Protect countertops with Vance Industries Surface Saver® built-in tempered glass cutting boards. This extra large 16" x 20" cutting board comes with special large feet for consumer to attach to bottom exactly where needed to custom fit around sink bowl. Available in a wide variety of styles. Fits over edge of sink bowl for easy salad and food prep. Sanitary work surface resists bacteria, stains, and odors. Durable, long-lasting, impact-resistant tempered glass. Protects surfaces from heat, scratches, and condensation. Choose standard colors: Almond, Black or White. To select one of our 20 X 16 Surface Saver or Corelle patterns from the Glass Cutting Board page (excluding Custom Design), choose Special and list pattern name in Customer Notes at checkout.